Gastric Bypass Complications – Long Term and Short Term! Gastric bypass surgery is a type of bariatric procedure that decreases the size of a patient’s stomach therefore allowing less food to be ingested at a time resulting in fast and significant weight loss. The ultimate goal of a gastric bypass is to reduce a total food volume intake, restrict amount of calories absorbed by the body and to suppress the appetite. Due to the nature of the gastric bypass operation, it is associated with some long and short term gastric bypass complications depending on the type of gastric bypass performed. In the United States the procedure is becoming very popular with gastric bypass surgery cost ranging between $18,000 and $35,000 depending on the scale of procedure and whether patients qualify for insurance coverage. Today there are three major types of gastric bypass surgeries performed by bariatric specialists. The Roux-en-Y bypass is performed by stapling the upper part of the stomach off its bottom portion. A surgeon then connects this newly created smaller pouch to the small intestines allowing ingested foods to bypass the portion of the stomach called duodenum that is responsible for absorbing fats from the foods. This significantly reduced the absorption of calories resulting in major weight loss. Mini gastric bypass is considered one of the most conservative and less invasive of all bariatric procedures with less gastric bypass complications involving little or no cutting. It is performed via a laparoscopic surgery and involves stapling parts of the stomach to shape it like a tube. Mini gastric bypass no-surgery option is considered a modified version of a Roux-en-Y procedure with fewer complications involved. Biliopancreatic gastric bypass is by far the most extreme of all gastric bypass procedures which completely alters the size of the stomach by removing about half of its normal size reserving the duodenum unlike the other types of surgeries. As with any surgical intervention, there can be some complications, both short and long term. Any time there is some tissue cutting involved, especially as invasive as in gastric bypass, there is always a risk of blood clots, internal bleeding or post surgery infection. In procedures involving stapling or plastic bonding, there’s a potential risk of staples coming undone requiring additional surgeries. Additionally, since intestinal organs are rearranged, a risk of hernia may be observed leading to intestinal obstructions. Many patients report other short term gastric bypass complications as increased nausea, inability to swallow foods and even vomiting. A “dumping syndrome” is another quite common complication following this bariatric procedure characterized by improper food digestion. Instead of gradually moving foods down the digestive tract allowing them to be digested in the stomach, undigested bulks of foods get literally “dumped” into the small intestines leading to indigestion and malabsorption of essential nutrients. However, as time progresses there are some long term gastric bypass complications that need to be taken into consideration as well. Among some of the common gastric bypass complications observed in almost all the patients is malabsorption of vital nutrients. Since parts of the stomach and intestines are either removed or rearranged, the body is not able to fully absorb all the nutrients from food resulting in deficiencies. Therefore a continuous monitoring of blood lipids, glucose and vitamins may be necessary to keep these among normal levels. Blood levels of calcium and iron could also be greatly diminished due to the bottom part of the stomach duodenum being bypassed where these nutrients are normally absorbed. Other dangerous long term gastric bypass complications can occur due to foods being leaked into the abdominal cavity because of the stitches or stomach staples coming undone. This is a very dangerous complication and can even lead to severe infection and death if not addressed in a timely manner. Morbidity rates though low but have been clearly documented in all age groups of patients having undergone gastric bypass procedures. 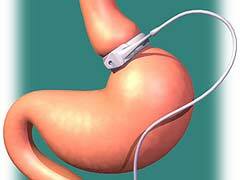 Weight gain after gastric bypass complication is not common but possible in certain patients. Most patients can avoid this unpleasant side effect by strictly adhering to doctor’s recommendations.